In the following work I have investigated the more elementary properties of the Ellipse, Parabola, and Hyperbola, defined with reference to a focus and directrix, before considering the General Equation of the Second Degree. I believe that this arrangement is the best for beginners. 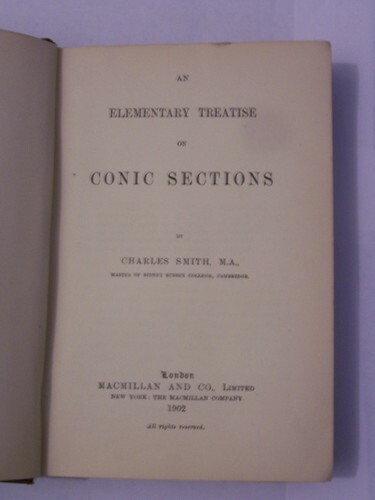 Contents: Pythagoras' theorem; Pythagorean triples; commensurable and incommensurable quantities; Eudoxus' theory of proportion; method of exhaustion; continued fractions; the surface area of a sphere; the method; regular polyhedra; symmetries; etc. Euclid's Elements is the most famous mathematical work of classical antiquity, and also has the distinction of being the oldest continuously used mathematical textbook. The main subjects of the work are geometry, proportion, and number theory. This is a text on 3-d Euclidean computational geometry intended to be used in engineering applications. On the other hand, the methods of Whitehead's algebra enable us to readily deal with Euclidean and non-Euclidean spaces of any dimension.